Backed by our team of dexterous professionals, we have emerged as a reputed Manufacturer, Supplier and Exporter of Swift Whispermill 599 EXL Motorized Treadmills. The Motorized Treadmills come with 3 years warranty. 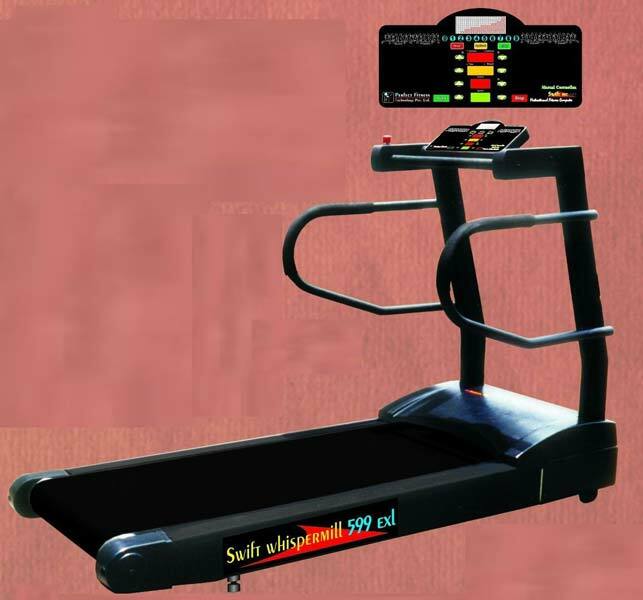 Bulk orders of the Treadmills are processed by us as per the specific requirements of the buyers. Buyers can obtain the Treadmills at market-leading rates from us. Drive System : Motor Controller With Dynamic Response Drive System. AC Motor Power Rating Should Be: 4 HP, 1phase, 200-220V AC, 50/60 Hz. Display Feedback : Time, Distance, Calories, Speed, Incline Level, Heart Rate, and METs Workout Profiles. Cross Bar Control : Quick Start, Stop, Program, Speed, Incline And Quick Setting Control.